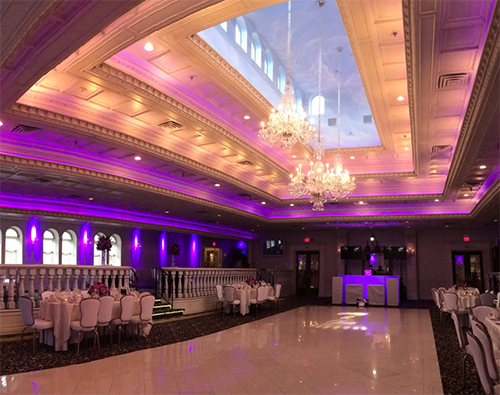 Up to 16x LED lights will be strategically placed around your main ballroom to wash the walls in a bright, vivid color that complements your wedding decor. During our initial meeting, we’ll discuss the colors of your wedding and how to match the Uplighting accordingly. After setting up, our Light Jockeys will fine tune the color of your choice to perfectly coordinate the room and set the tone for your event. Create a special energy throughout the entire room with tailored Lighting Control. Our Light Jockeys can manage your Uplighting throughout the night by flashing colors of light on the walls to the beat of the music. This upscale effect will make your night feel professional and unforgettable. Is this service what you're looking for? Do you have any questions about this service? Don't hesitate to ask!